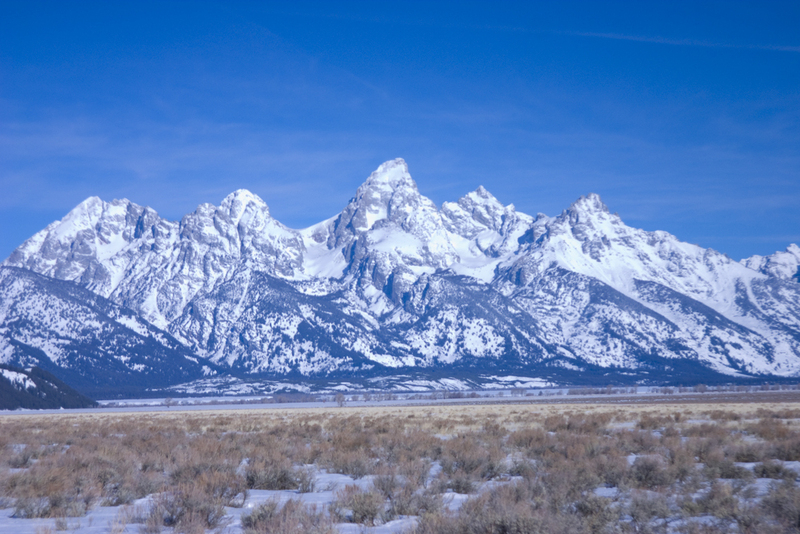 We have just ordered our first series of Jackson Hole Tim gift cards. These cards will be 5×7 inches and come with a plain white envelope for mailing. The back of the cards have credits while the inside of the cards are blank. You write and share any message you desire. All 6 of these images were taken Timothy Jennings here in the Jackson area. They will be available shortly on our website right here for $3.95 per card plus shipping. Spring morning looking west at the Grand. Sunshine is on tap for the day! It has been several weeks since my last post – not sure where all the time has gone but the truth is winters can be long here in the Rockies. As we move from the depths of winter into the Spring season you can just feel the change happening. Not only with Mother Nature but with the people of this area. People attitudes start to change very quickly when Father Sun finally peaks out of the clouds. So what have we been doing for the past several weeks? Good question – but I thought I would post just a couple of things that have happened. One of the sad notes in Jackson has been all the moose that have been killed by cars this winter. These big beautiful animals just do not understand the dangers of the highways. This morning after we dropped our daughter off at school in Wilson we headed for the Elevated Grounds coffee shop on the West Bank. As we approached the coffee shop a mother and her two calves decided to cross the road and as we slowed to a stop we almost witnessed another accident. Although this is not a good picture you can see the mother walking down the driveway just after crossing in front of our Jeep. Her two calves followed but almost did not make it across the road. If you visit this summer please be aware that you can be faced in a heart beat with this kind of interaction with these big beautiful animals. 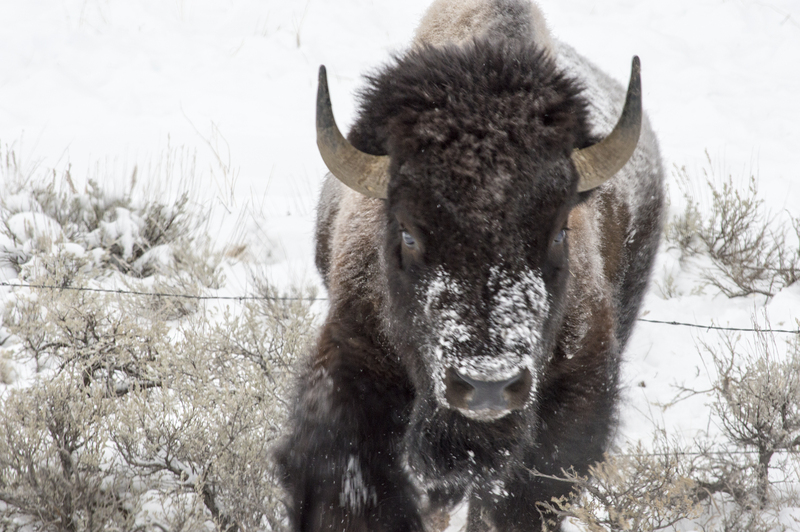 A few weeks ago we made a visit to the north side of the Elk Refuge during a blustery winter day. 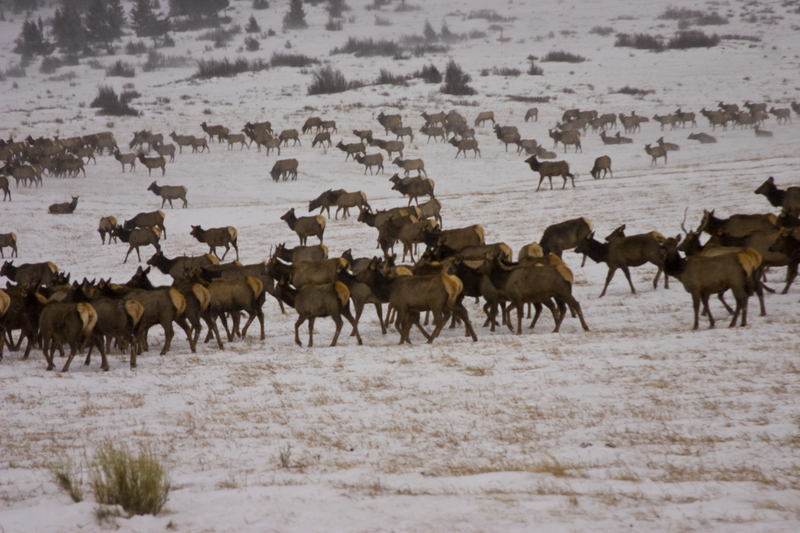 We came upon an entire heard of elk all moving to the east trying to get out of the wind. This picture does not capture the enormity of this heard but we were really close. This picture was taken with a 50mm lens and this group was almost 3/4 of mile long. At one point we just parked on the road side and watched them. It is really cool to see how the stronger males take charge and keep an eye on you. To be able to experience this so close to home is really a treat. It won’t be long before they start to move back up into the high country. It looks like a warm Spring is about to arrive. Our son Brock was asked to play a few of his songs at an event at the Jackson Hole Playhouse and Saddle Rock Saloon recently and it was really kind of a cool little event. For those of you who may be planning a visit here this summer you absolutely need to make time to go to the play this summer. The plays are really a must see event here in town. This summer the play is Cat Ballou and the season opens June 1st and runs through September 29th. One of the cool things about the playhouse is that you can make reservations for dinner prior to the show. 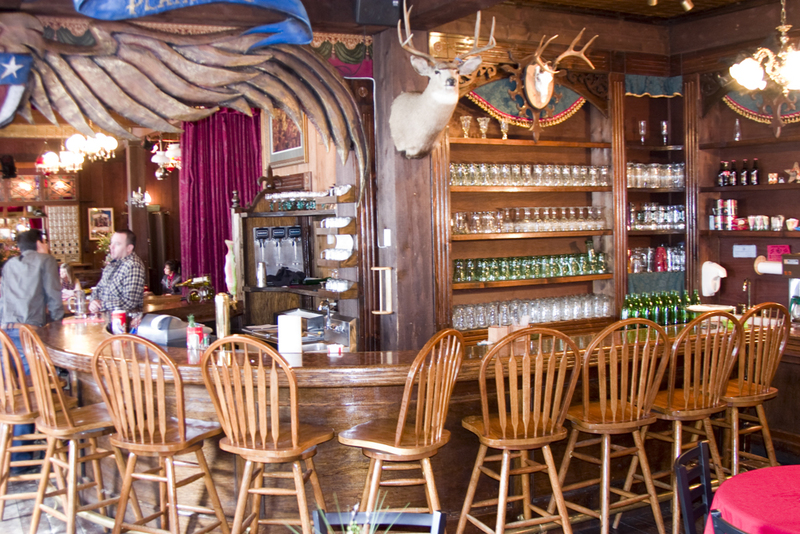 Having dinner at the Saddle Rock Saloon is a really fun family event. The casts are your waiters and they sing and perform during your meal. This is a really good way to get to know the cast prior to the show. 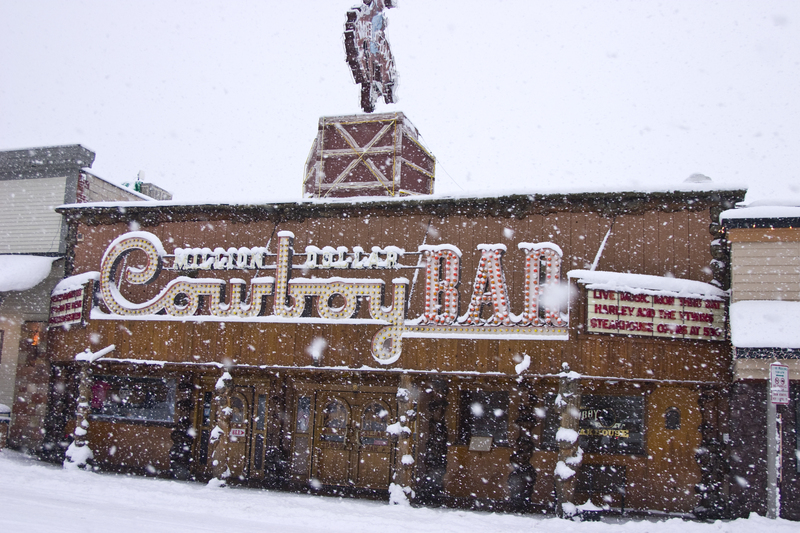 The playhouse is one of the oldest building in Jackson Hole with a really interesting history. The cast will share with you all the things that have taken place over the last 100 years at this very location during the Pre-Show event. If you are looking for an opportunity to do something with your entire family that will stay in your memories for a lifetime then you must put the Play House on your bucket list. Since our last post we had one of the better winter storms roll through the region leaving a solid blanket of snow. On these mornings when we wake up to heavy snow we like to cruise the town as it turns into a winter wonderland. The heavy snow creates such a beautiful atmosphere and one of our favorite things to do is just park and take a walk. If you have never taken a walk in the middle of heavy snowfall then make sure you make the effort to do it at least once in your life. Yes its cold but it is almost hard to put into words what the experience is like. Finally I wanted to share with you that there are wonderful things to do outside of our valley. It is a good thing when you can take even a day trip to another place. Winters can be long and it helps if you can get away even if for just a few hours. 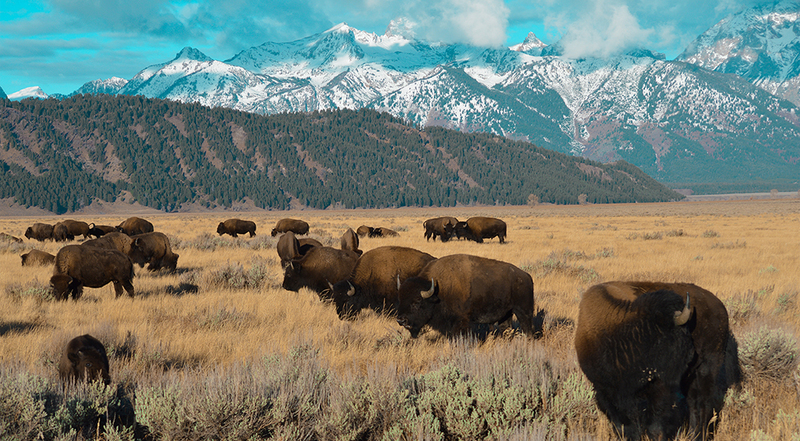 One of our favorite day trips is to head to Bozeman Montana for the day. 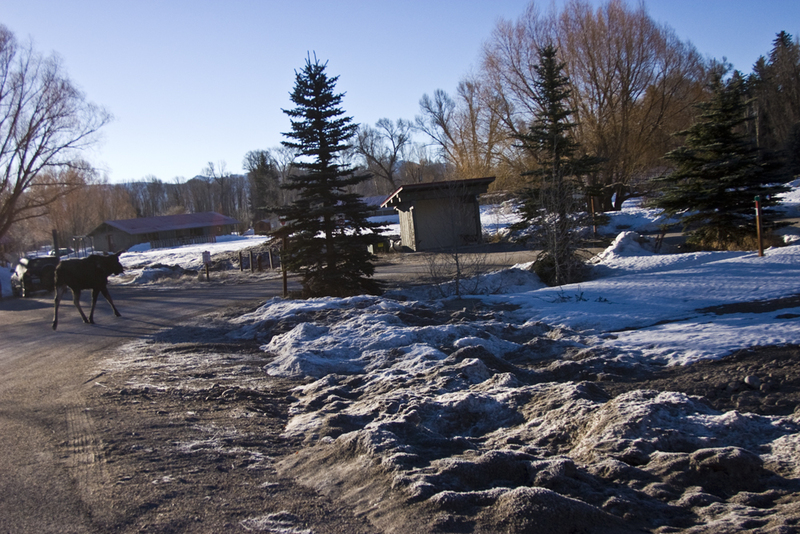 On this day which was just a week ago we found the town of Bozeman to be free of snow and almost 70 degrees. Brynn and her friend told us it was summer in Bozeman and how happy they were to see the sun. We stopped by the Museum of the Rockies which a very cool place to visit. 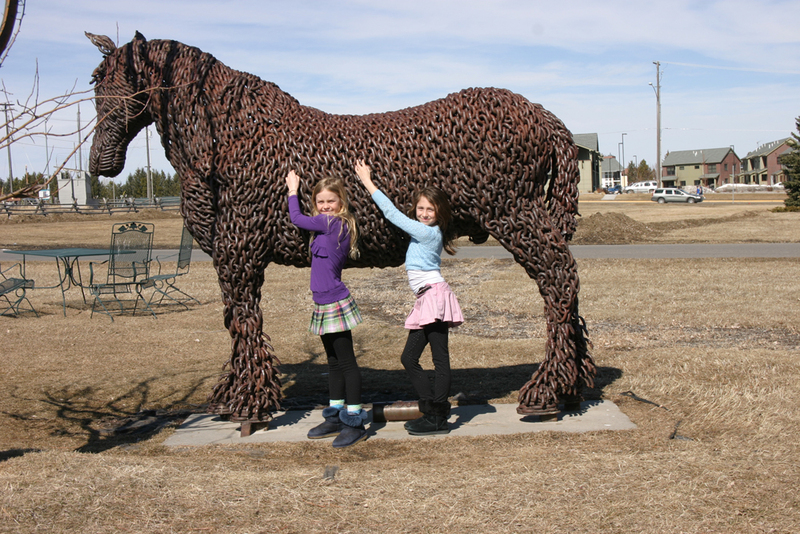 The girls wanted to take a picture next to this big horse and just get out of the Jeep and run around. Look for more Morning Coffee Posts now that Spring has arrived and as we venture from our homes into God’s country this summer. 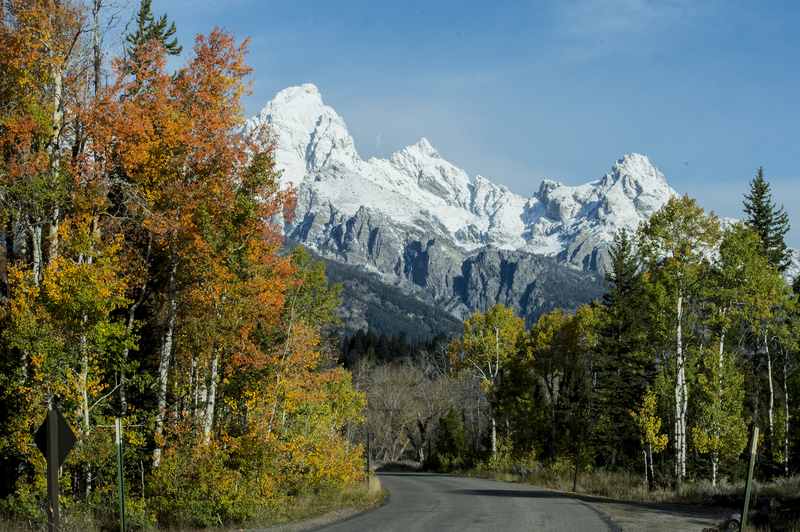 This mornings coffee run took me 40 miles north of Jackson into Teton National Park to one of the most photographed places in the United States, Oxbow Bend. 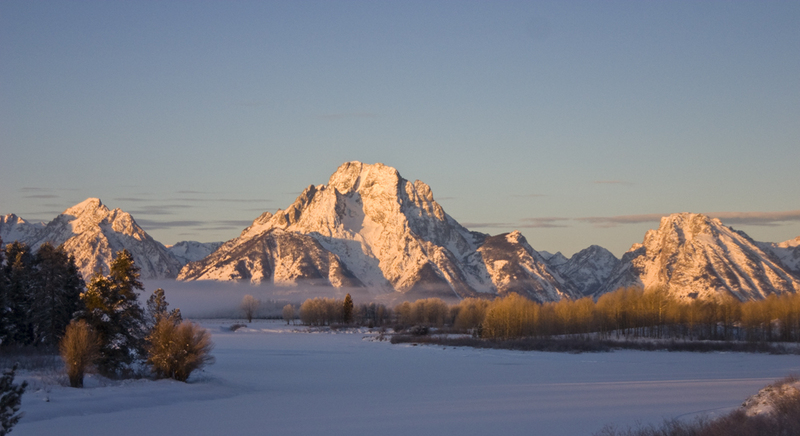 Oxbow is just north of Moran Junction about 4 or 5 miles and on this morning it was -15 degrees as I arrived just before dawn. In the summer there is always a multitude of photographers waiting for the sun to bathe the mountains with its warmth. Today I was all alone, with the exception of my father-in-law who made the journey with me. We arrived as it was still dark and set up for the shots I wanted, some of which I am sharing with you here. 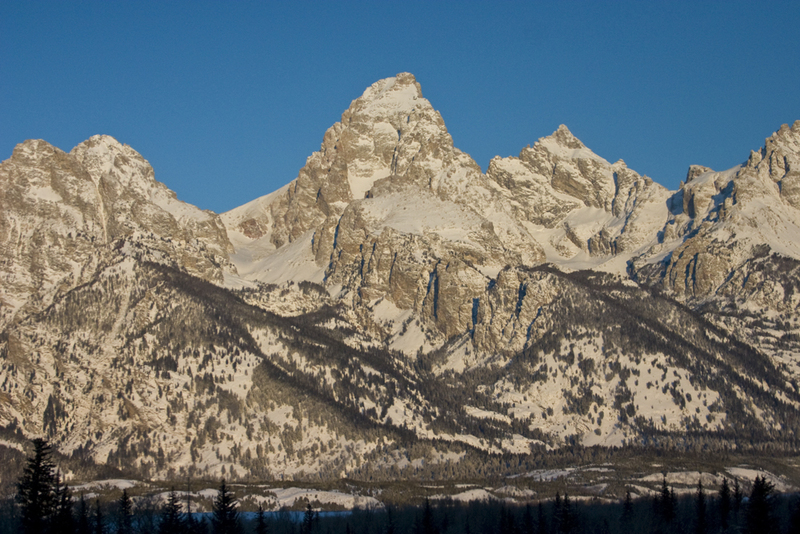 As the sun makes its way over the eastern range it begins to bathe the Teton Range with a warm glow. This all happens in about 12-15 minutes so you need to be ready with your camera. Now I am no professional but you would have to try pretty hard to screw this up. 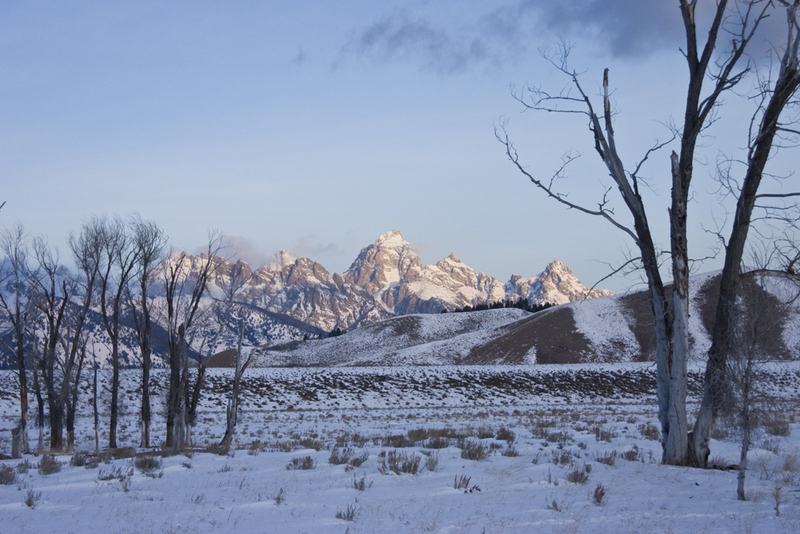 Here are a few pics of the Oxbow Bend with Mount Moran in the back ground all taken within minutes of each other. You can see the difference in the shots as to how the sun bathes the mountains and the river. Oh yeh – this is the Snake River for those who do not know this area. Amazing is all I can say. Put this on your bucket list for sure. On the way back I took a detour and found some of my favorite subjects. I counted over 18 moose this morning all within a few hundred yards of these shots. I almost got stepped on when this big guy came within a few feet of my Jeep. A few feet is no exaggeration! I never tire of seeing these beautiful creatures of nature. They are so unique and awesome to be this close to. If you venture out – be careful because they can hurt you. Enjoy!